Oliver James Platt is a Canadian-born American actor. Platt was born in Windsor, Ontario to American parents. The family relocated to the United States when Platt was three months old. His father was a career diplomat, which meant Platt had to relocate multiple times in his youth. He spent his childhood in Japan, the Middle East, and Washington, D.C. Platt graduated from the Colorado Rocky Mountain School in Carbondale, Colorado, and majored in drama at Tufts University. He spent three years working in theatre in Boston, Massachusetts before touring with the Shakespeare and Company theatre group. By the mid-eighties Platt had settled and working in theatre in New York. The American actor Bill Murray attended a show featuring Platt and recommended the actor to director Jonathan Demme, who cast him in 1988’s Married to the Mob. Platt continued a career acting in motion pictures, with notable roles in Working Girl (1988), Beethoven (1992), The Three Musketeers (1993), A Time to Kill (1996), Lake Placid (1999), The Ice Harvest (2005), and 2012 (2009). Platt also acted for television, having major roles in the series Dealine, The West Wing, and The Big C. Platt was nominated for two Emmy awards and a Golden Globe, won the New York Film Critics Online Award for best supporting actor for his role in Casanova. Platt continued acting in theatre, making his Broadway debut in 2006 with Shining City, for which he was nominated for a Tony for “Best Performance by a Leading Actor in a Play.” In 2009, he starred in a Broadway revival of Guys and Dolls. He married Mary Camilla Bonsal Campbell on September 12, 1992, with whom he had three children. The Platt family currently resides in North Haven, Maine. “All rise!” Tufts enews. Jan. 10, 2003. Web. Accessed Feb. 13, 2018. 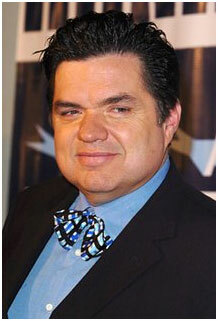 “Oliver Platt.” The Internet Movie Database. Web. Accessed Feb. 13, 2018. Rabin, Nathan. “Interview Oliver Platt.” A/V Film Club. Jun. 5, 2010. Web. Accessed Feb. 13, 2018. Rozen, Leah. “Cilantro, the flavor of memory.” New York Times. Sept. 10, 2010. Web. Accessed Feb. 13, 2018.